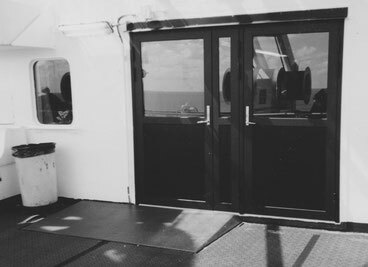 BPAB offer marine and offshore clients a number of different heat tracing composite products such as tempered coating of ramps, heated gangway tiles, anti-ice deck pads, ice free step covers etc. Our ingenious products are built on a multi-material basis consisting of lacquered and skid-free steel top, fiber composites, insulating materials and miscellaneous merge-material. All components are selected with heavy duty marine standard in mind. Anti-ice systems from BPAB are extremely resistant against oils, chemicals and mechanical wear and tear. BPAB's Anti-Ice Systems such as marine Anti-Ice Deck Pads have a much better, and more efficient, heat distribution over the entire surface compared to heat tracing cables. 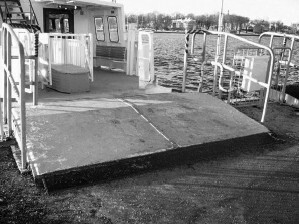 For ships and offshore structures we can offer enhanced Anti Ice Deck Pads and Anti Ice Stairway Systems in fire-retardant materials for deck surfaces, stairs and gangways to the benefit of both passengers and crew. Onboard marine boot surfaces one most often wants to avoid stumbling edges. That's why we manufacture the pads with smooth ramped edges and only 30 mm in height. The thin pads are easily connected directly onto the deck/base by friction welding. With a temperature-controlled wheelchair ramp one does not need to shovel away the snow and ice. A clever way to save costs, improve safety and increase accessibility. The clip above shows that the Anti Ice Deck Pads are truly very sturdy and resistant to "hard hit" impact. A 5kg steel ball is repeatedly dropped from 70cm height in cold climate (-27 C).